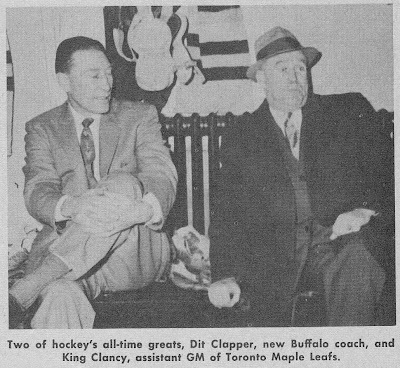 For decades, the venerable King Clancy was a fixture around the Toronto Maple Leafs and Maple Leaf Gardens. Clancy, as a player, was a star well before my time. (He is pictured at right in the late 1950s with another hockey legend, long-time Bruins star Dit Clapper, who had taken on the coaching job with Buffalo in the AHL.) But hockey fans of yesteryear all know the story that Clancy was traded/sold by Ottawa to the Maple Leafs back in the very early 1930s, and he became a Hall-of-Famer—elected in the late 1950s. By all accounts he was a small, high-spirited, elite player in his day, with unusual offensive skills for a defenseman. He retired in the mid-latter part of the 1930s. He stayed in the game as an on-ice referee, I believe, and ended up coaching his “alma mater” in Toronto. In three seasons in the early 1950s, his Leaf teams never won a playoff round. Yet he was one of those guys that was well loved, and always managed to keep a job with the Leafs. He was at various times coach, assistant General Manager and just about everything else for the club, from the 1950s until his death in 1986. While he preceded Punch Imlach’s time in Toronto, he stayed on as Punch’s assistant, advisor and sidekick when Imlach arrived in 1958. While Punch had the media lapping up everything he said in those halcyon days for the Leafs, Clancy earned his share of the limelight because he was always upbeat, optimistic, eternally positive—and quotable. One of Clancy’s other tangible contributions occurred when he would take over behind the bench for Punch on occasion—most notably when he did so in the midst of a terrible slump during the famous 1966-’67 season. At the time, the Leafs were a struggling team, having lost something like ten games in a row. Imlach went into hospital, suffering by various accounts from fatigue and/or nervous exhaustion. Under Clancy’s routine of shorter, less structured practices and the more laid back and genial atmosphere that he nurtured, the team worked its way out of its struggles, and made the playoffs that spring- with Imlach back behind the bench. Of course, we know the rest of that story. The Leafs upset the heavily favored Black Hawks in 6 games, and did the same to the then two-time defending Cup champions from Montreal. Clancy deserves his share of the credit for loosening the reins on a tight, aging club before it was too late. The truth is that while the Leafs under Imlach and Clancy, in the late 1960s, were introducing some good young talent onto the squad (Ellis, Stemkowski, Unger, Pappin and a corps of young defenseman like Rick Ley, Jim McKenny and Mike Pelyk) then owners Harold Ballard and Staff Smythe had had enough of Imlach’s ego. After a four and out showing in the playoffs against the Bruins in the spring of ’69, Imlach was gone. However, Clancy survived the purge and after Smythe died and Ballard had spent some time in jail for various offenses while running the club, Clancy became Ballard’s lasting friend, sidekick, advisor and sounding board. Clancy was a living legend (click here to read about my impromptu job “interview” with Clancy in the mid 1970s, when I walked in off the street to talk with him) in Toronto, and seemed to know everyone in and around Toronto. He was a devoutly religious man, though Ballard, his close friend, was evidently not. The team had its moments, good and bad, through the ‘70s. I’ll always remember, during the brawl filled Game 2 of the 1971 playoffs against the Rangers, Clancy wandering around Madison Square Garden trying to find Bernie Parent’s mask in the crowd after Ranger forward Vic Hadfield had thrown it into the stands. He must have known something, because soon after the season the Leafs indeed had three goalies in place—Doug Favell from the Flyers (in return for the rights to Parent, who had left the WHA but didn’t want to play again in Toronto), Dunc Wilson from Vancouver and Eddie Johnston from the Bruins, probably as part of the Plante deal. It was just funny to hear old Clancy defending the Leafs and their moves at the end of a horrible season, sounding full of fight that the awful Leafs would be just fine the next season. And they did make the playoffs in the spring of 1974, at least. Today, the Leafs have a front office full of smart, sharp, sophisticated hockey people: Burke, Dave Nonis and Dave Poulin are the backbone of the Leafs think tank, and a sound group it is. Burke brings a kind of Irish charm, energy and quotability, for sure. But generally it’s a dour, serious group. Maybe it wouldn’t hurt, especially as the team continues its slow build back to respectability, to have a “character” in the building, someone who would say something outlandish- in a good way—once in a while. To breathe some excitement into the building, bring some pizzazz. And every once in a while, convince a superstar to come to Toronto, as Clancy did with Red Kelly fifty years ago. But where can you find a modern-day Clancy—a former playing legend, full-time character and someone unabashedly loyal to the Leafs and the Leafs- forever and only? He was, as they say, one of a kind.